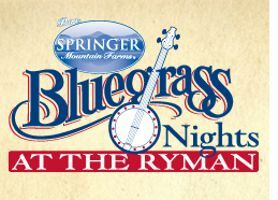 “We are excited to celebrate our 10th year of Springer Mountain Farms® Bluegrass Nights at the Ryman. Springer Mountain Farms® is the purest form of chicken and bluegrass is the purest form of country music. There is no better place to enjoy bluegrass than the very place it was born, the historic Ryman Auditorium. I am proud that Springer Mountain Farms® has been part of continuing this great tradition,” said Gus Arrendale, president of Springer Mountain Farms®. Tickets are on sale now for just $28.50 at the Ryman box office at (615) 458-BLUE and online here. Shows begin Thursday, June 23 and continue every Thursday evening through July. Fans can come early to the Ryman’s newly opened Nashville eatery and bar, Café Lula which always features Springer Mountain Farms® signature chicken as well as other tasty entrées and sandwiches. Diners can also enjoy house made chips, local beverages, and desserts baked fresh daily. “We have been incredibly fortunate to partner with Springer Mountain Farms® on Bluegrass Nights at the Ryman for the last ten years. Their support has allowed us to put on one of the preeminent bluegrass series in the country. Last year we expanded our relationship to Cafe Lula, where we now serve Springer Mountain Farms chicken and we couldn’t be prouder,” said Ryman Auditorium General Manager, Sally Williams. Springer Mountain Farms® is a family owned business that has been raising chickens for over 40 years. Years ago in the hills of Northeast Georgia our founders started selling chickens in the back room of their grocery store. They built the company on strong values and kindred relationships within the farming community, and all of the farmers, with up to forty years of experience and third generation families, take great pride in what they do to raise the finest chicken on the market today. Over the years, through studying and learning about the benefits of better animal care, better living conditions, and more stringent biosecurity practices, Springer Mountain Farms® became the first poultry producer in the world to gain the endorsement of American Humane Association under their American Humane Certified program. We exercise great care in all that we do, and we know you'll be able to taste the difference. “Great Care. Great Taste.” For more on Springer Mountain Farms® please visit www.springermountainfarms.com. A National Historic Landmark, Ryman Auditorium was built as a tabernacle by Captain Thomas G. Ryman in 1892, served as the home of the Grand Ole Opry from 1943-74, and was completely renovated in 1994. The Ryman is open for tours during the day and at night offers a wide variety of entertainment performances, just has it has for over 120 years. The venue was voted the 2010, 2011, 2012, 2013, 2014 and 2015 Pollstar Theatre of the Year. Ryman Auditorium is owned by Ryman Hospitality Properties, Inc. (NYSE: RHP), a Nashville-based REIT that also owns and operates the Grand Ole Opry, and 650 AM WSM. For more information, visit ryman.com.